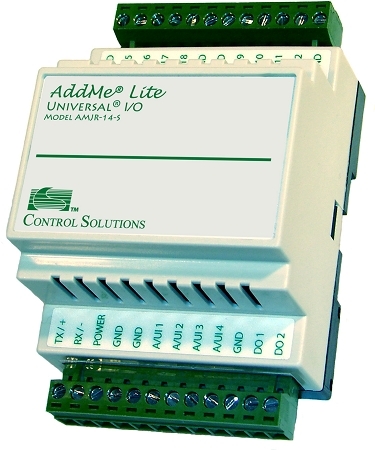 AddMe Lite Model AMJR-14-SB makes an ideal add-on BACnet MS/TP I/O node, or stand alone freely programmable controller. 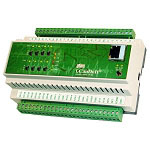 Its 14 I/O points include 12 analog/universal inputs (pulse on 2 inputs), 2 FET outputs. Analog Input objects provide data from the analog I/O points. Linearization tables are provided for 10K and 20K type II, III, and IV thermistors. Input type and scaling is configured by writing to object properties. Binary Output objects provide BACnet access to the outputs. An additional 60 writeable Multistate Input objects are available for use by the user's program. - - - 0.15A @ 24VDC max.